Finding buried treasure can now be done hassle-free! Dive into a thrilling world of treasure-hunting, not only on the beach but also in the woods, desert and ruins with the TC-1018 fast action sand and surf metal detector from Treasure Cove. Lightweight and durable, this state-of-the-art metal detector is packed with features that will aid both budding and seasoned hunters to find and identify objects buried underground even before you start digging. It is easy to operate, thanks to its self-tuning feature. Just turn it on and you’re good to go. Using this mode makes the detector coil very sensitive to the proximity of any metal. Any metal the coil picks up will trigger the unit to make a constant tone, which will get louder and clearer the closer you get to the target. Using the discrimination mode tells the operator the exact metal composition of an object. This saves you the effort, and the frustration, of digging for something only to find out it’s not what you’re looking for. This feature is for the treasure hunter who wants to look for any type of buried metals. A favorite of hobbyist treasure hunters, turning on this feature will tell the TC-1018 to go after any metal object in its path. It is the ideal way to make your discoveries with ease. Go treasure hunting even in shallow water with the TC-1018. Its 7.5 inch waterproof search coil can even be submerged in water if needed, allowing for almost unlimited treasure hunting options even in muddy conditions. Comes with headset, durable carrying bag, and trowel (shovel). Click the “ADD TO CART” button NOW to order. 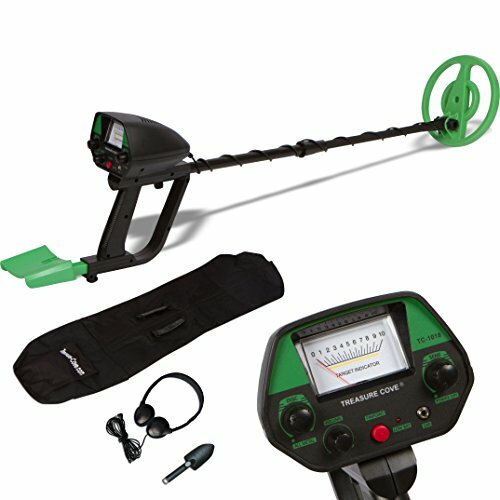 PACKED WITH FEATURES: The Treasure Cove TC-1018 pro metal detector is loaded with customizable features that budding, and experienced treasure hunters will surely love. It is easy to operate and portable, ensuring hours of enjoyable treasure hunting. WATERPROOF SEARCH COIL: The Treasure Cove TC-1018 metal detector's waterproof design (7.5-inch water proof search coil) enables you to detect a US quarter at depths up to 8 inches when in ALL METAL mode under most soil conditions. ANALOG EASY-TO-UNDERSTAND DISPLAY - The informative analog display screen enables you to know the composition of a detected object and its depth. With this, you don't have to guess if you hit the jackpot while using our fast action metal detector. THREE TARGETING FEATURES: The TC-1018 fast action metal detector comes with three selectable features. The "All Metal Mode" detects any metal object underground. "Pinpoint Mode" will make the detector very sensitive to the proximity of metal and will make a constant tone, which will get louder and clearer the closer you get to the target. "Discrimination Mode" on the other hand can distinguish between precious metals and junk metals. 10-YEAR WARRANTY: Treasure Cove is so confident in the quality of our metal detectors that we offer an industry leading 10-year warranty on the TC-1018 Fast Action Sand & Surf metal detector. Use your product with confidence knowing that your purchase is protected.